Good Charlotte is an American rock band from Waldorf, Maryland that formed in 1996. 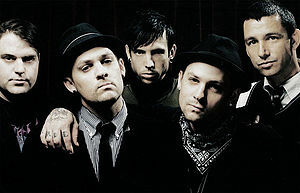 Since 1998, the band's constant members have been lead vocalist Joel Madden, lead guitarist and back-up vocalist Benji Madden, bass guitarist Paul Thomas, and rhythm guitarist and keyboardist Billy Martin. Their latest drummer and percussionist is Dean Butterworth, who has been a member of the band since 2005. Just seen this rather amusing article on RFT about Joel Madden from Good Charlotte. He was rehearsing in a studio next to Morrissey's band. Moz wasn't there and he asked the band if he could sing along to Suedehead and they duly obliged. Joel claimed "It was probably one of the coolest things I've ever done in my life"! After going on tour with Morrissey in 2002 and 2004, drummer Dean Butterworth joined Good Charlotte on tour in 2005 and became a permanent member. At a 2006 concert in Tulsa, OK, Morrissey mentioned that his previous drummer was "poached." ↑ Good Charlotte Wikipedia page. Wikipedia. Retrieved from Wikipedia.org. ↑ BelowTheWaterline. Tulsa, OK - Cain's Ballroom (Mar. 13, 2006) post-show comment. Retrieved from morrissey-solo.com. This page was last modified on 8 April 2013, at 08:06.